Never before have the civil rights of people with disabilities aligned so well with developments in information and communication technology. The center of the technology revolution is the Internet's World Wide Web, which fosters unprecedented opportunities for engagement in democratic society. The Americans with Disabilities Act likewise is helping to ensure equal participation in society by people with disabilities. Globally, the Convention on the Rights of Persons with Disabilities further affirms that persons with disabilities are entitled to the full and equal enjoyment of fundamental personal freedoms. This book is about the lived struggle for disability rights, with a focus on Web equality for people with cognitive disabilities, such as intellectual disabilities, autism, and print-related disabilities. 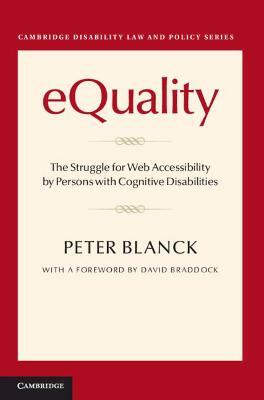 The principles derived from the right to the Web - freedom of speech and individual dignity - are bound to lead toward full and meaningful involvement in society for persons with cognitive and other disabilities.